Andy H: Love is the air as Valentine's Day fast approaches and what better way to celebrate (apart from lavishing your better half with oodles of luurve, of course) than spending time with that crazy cutie, Harley Quinn! 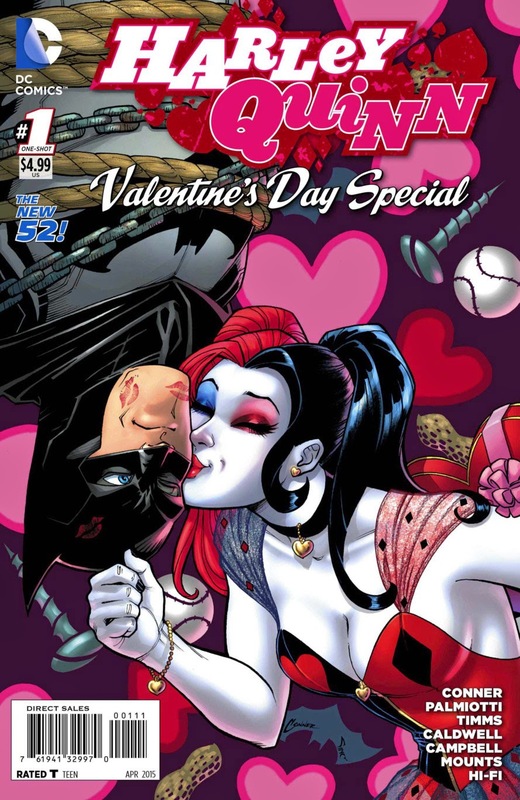 The one DC character that seems to have a special book for any occasion of course has her own Valentines Day Special. We should be able to expect all the usual madness from Harley as regular writers Amanda Conner and Jimmy Palmiotti take HQ on a date with Bruce Wayne. Never a taxing read but for me, a guilty pleasure. On a slightly 'darker' note and possibly more complicated, we reach the end of 'Spider-Verse' in Amazing Spider-Man #614. With so many versions of Spidey about it can get a bit confusing but overall I've really enjoyed the story as of the Spiders being hunted down. It all comes to a head here and I hope Dan Slott brings it to a satisfying conclusion. Also coming to an end is Wild's End, the fantastic War Of The Worlds story featuring the animals of Crowchurch battling frightening metal monsters. Dan Abnett and I.N.J. Culbard have created a world of engaging characters, first and foremost for me being the mysterious Mr. Slipaway. It feels like there's further story to tell so hopefully this is only the end of the first chapter and more will follow soon. I'll be waiting for it! Tom P: I had an onslaught of titles last week so only having a few books on my shopping list is warmly welcomed. First out the gates is the excellent Southern Bastards #9. I can't praise this book enough. Great dialogue, tight art, compelling characters and a plot that twists like a rattlesnake. What more would you want from a comic? The only other title that's a sure thing is Thor #5. So that's two titles from Mr Jason Aaron who it has to be said is on terrific form and seems to be able to switch styles and genres with ease. While on the subject of his writing, I must admit I was a little hesitant when approaching the Marvel Star Wars relaunch. However, an impassioned Matt C managed to allay my cynicism so I expect I will see if Paradox still has the first two issues. Darth Vader #1 is also released upon us tomorrow, and I might just dive in and give in to my love of all things Star Wars. After all... it is pointless to resist, my son.